Kids seem to have never-ending reserves of energy when it comes to playing. And they sleep like a log afterwards unlike grownups. The grownups wish if they could play and sleep like the kids. Whether the kids are playing with their pull along toys or having a sound sleep cuddling their teddy bear, they look adorable. 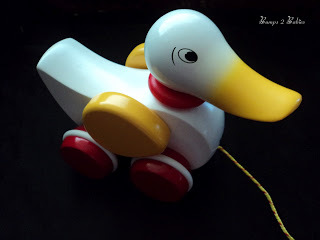 In not so distant past, one of the prime entertainment resources of kids was physical toys like push and pull along toys. Though the toys aren’t gone yet, the playtime is being shared by video games, and it is gradually increasing. Extended screen time is not healthy for the cognitive development of children, which means we must understand the current shift to video games, and the effectiveness of push and pull along toys. Kids’ playing preferences started taking a new turn with the launch of video games. The first ever video game was released in October 1958, created by Physicist William Higinbotham. They gained huge popularity in 1970s. The video games namely Computer Space and Pong became the regular part of kids’ playtime. Today, gaming has become a billion-dollar industry. Sony and Nintendo rule the gaming kingdom. They have introduced huge, cinematic screens to play games. On the other hand, mobile phone companies made handheld game devices more dynamic and charming, for instance, Apple’s iPad. iPad games are consuming a big share of kids’ playtime, which is alarming. It may not call for a ban on iPad or iPad games, but their introduction and time consumption must be strictly controlled. Physical activities in kids’ early years are essential for proper growth. A pull along toy is the perfect tool for this purpose. Moreover, when the kids pull their toys, they gradually learn how to balance the physical stuff. Please, ensure you get quality toys from, a reputable store such as https://www.goodtoplay.com/ to allow kids learning the balancing factor properly. A poorly-balanced toy can irritate the kids. On the other hand, iPad games glue the kids on their chairs. What’s worse, regular and longer iPad gaming sessions can develop lethargic behaviour. Another great learning benefit is the development of supporting and sharing behaviour. Physical toys allow for the involvement of many kids at the same time. When the kids are playing together, they develop supporting and sharing behaviour. An iPad has no chance of involving the kid sitting beside in the game. What’s worse, the player kid can develop superiority complex. The other kid can fall victim to instilling negative feelings. The kids treat their pull along toys as if they were real. If their toys are hurt, they react with sympathy and emotions. Thus, they become more caring and it also discourages destructive thoughts. In case of iPad, all feelings are instantly over the minute it is turned off or the game is restated. With a pull along toy, the kids learn handling an object in multiple ways. It also helps them make their grip firmer and strategic, thus, kid’s motor skills are groomed properly. A child playing with a pull along train or a horse simply brings immense joy to the beholder. For parents, these are the adorable moments to cherish forever. In addition to these cute moments and memories, pull along toys help your kids to be active, and develop their motor, thinking and social skills.